The breathtaking new adventure starring Ben Hope. A lost, aimless, and hard-drinking Ben Hope has wandered back to his old haunt in Ireland. The ex-SAS soldier is searching for peace, but trouble soon appears when Kirsten Hall, a young journalist, is brutally murdered right in front of him. Unable to prevent it, Ben is driven by guilt to hunt down the killers. All he has to go on is a handful of clues from Kirsten's research--but how can the journals of Lady Stamford, the wife of an English lord during the time of the Irish Great Famine, have put Kirsten in mortal danger? Ben's quest for the truth leads him across the world and finally to Oklahoma, USA, where a deadly secret awaits. What connects the journals, a wealthy American politician, and an intrigue surrounding the Irish famine? This was a fantastically absorbing book, set on a very interesting period in history. The Ben Hope books are a very enjoyable series, and this one was well narrated by Will Rycroft. 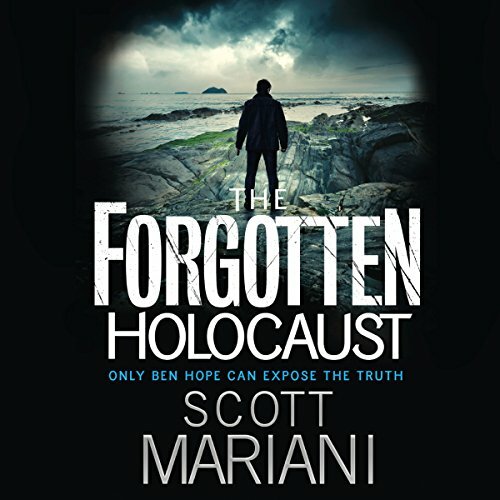 The Forgotten Holocaust is the 10th book in the Ben Hope series, and although it does make brief references to Ben’s past, it can be read as a standalone novel. It offers a fast paced, action packed adventure with an interesting underlying historical story, the Irish Potato Famine of the late 1840s. This novel takes you back to one of the darkest periods in Irish history and seamlessly weaves the history and action together. To escape the turmoil in his private life ex-SAS Ben Hope returns to his old haunt in Ireland where he meets Kristen Hall, a young journalist researching the life of Lady Stamford, the wife of an English lord during the time of the Irish Great Famine. However her attention is diverted by something explosive that she has uncovered but before she can tell Ben what that is, she is brutally murdered. Armed only with her abstract notes, her mobile phone and his investigative skills, Ben decides to find out what was the connection between the Irish Great Famine and the important political person in America that she had been contacting and whether it had anything to do with her being murdered. I could not put it down until I had reached the end, an absolute page turner. Another fantastic story. Recommend to anyone who enjoys following Ben Hope. Voice narration as always excellent. Enjoyed this book and the narration was very good. Will Roycroft (in my opinion) fits the role perfectly - it is how i imagined Ben Hope to sound. Also his reading emphasis tension and fast paced action! The book is a great thriller as usual with Scott Mariani's writing. If you like a fast paced action packed story i would recommend it. I must say, I started listening to this title with a bit of hesitation. I usually go for simple and easy reads and after having read reviews likening this book to the Da Vinci Code, I wasn't sure if it'd be as easy a read as I'd hoped. Loved the story, keep writing Scott and keep Ben alive for more exciting adventures and so well read. The story, like all the others before it, was amazing! I've come to know these characters! I just wish the American accent was played by an American. Like I said a million times before, Americans do not sound an 'r' at the end of words! Gr! good story line with very interesting history facts.....looking forward to the next book well read and easy listening.